The creative talents of Robert Burns extended beyond his poetry and songs when he decided to design his own seal in 1794. In the medieval era a badge like this would have had aristocratic or militaristic origins. So why did a humble farmer poet, who was a believer in love rather than war, want a coat of arms? Burns’s creation can be seen imprinted in crimson wax and on his seal matrix within the exhibition collection at Robert Burns Birthplace Museum. 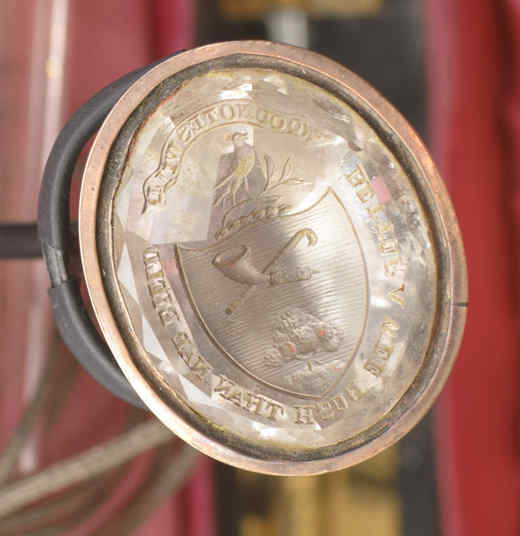 This seal was a public declaration that Burns considered himself equal to any nobleman, and this would have given a clear signal to any that would have seen it. This was an important token of personal and familial identity for Burns, which he would have imprinted onto his letters. Burns decided to incorporate two mottoes within his seal. ‘Wood-notes wild’ is inscribed across the top of the seal, whilst along the bottom there is the phrase ‘Better a wee bush than nae bield’ (shelter). The first inscription could be signalling how nature has often been an important inspiration in his life, both visually and musically. He often said his wife Jean had the sweetest wood-notes wild singing voice. In the second motto Burns could be highlighting his fears of homelessness that frequently haunted him towards the end of his life. This reminds us to respect Mother Nature, as she can be a refuge for a wee mousie to all mankind as well. In the centre of these two mottoes Burns has placed a shepherd’s crook and pipe, signalling his lifelong connection to nature through his agricultural background. One of the main elements in his design is a Holly Tree at the bottom. Perhaps Robert Burns wanted to display his love of nature prominently, or perhaps there is another layer of meaning to consider. In Celtic mythology a Holly Tree was a guardian in the dark, winter months. It was seen by the people as a symbol of peace and goodwill. Furthermore, the Druids believed that Holly possessed protective qualities and that it could guard against bad luck and evil spirits. Therefore, this could be Burns recalling his time as a child when he heard stories of folklore and superstition from his mother and Betty Davidson. A woodlark is a symbol of cheerfulness and joy even in the worst of times, something that Burns would have related to as his own spirits rose and fell throughout his life. But the similarity between Burns and the woodlark does not end there, since this particular song bird can mimic and remember other birds’ songs. Burns was a great lover of songs and music since boyhood, so in order to preserve the traditional songs of his beloved Scotland; Burns dedicated himself to collecting them. These were gathered together and published in an anthology called Scots Musical Museum by James Johnson over several years. In the closing decade of the eighteenth century, discussion on republicanism and equality were politically rife questions. Robert Burns did not meet the requirements to vote; as such he used his pen and voice to challenge the political authority of the time. In his seal matrix Burns has placed a woodlark upon a branch of bay leaves. In Roman mythology bay leaves were treasured by the Gods, as their crowns of bay leaves connoted their high status and glory. By placing a woodlark, a song bird like himself on top of the branch, Burns could be trying to say his voice has greater potency then the established authority. In addition to this, it could also be interpreted as a form of mockery, as a single songbird could undermine the glory of those in power with his voice alone. Burns deliberately incorporated multiple layers of meaning within several of his poetical works, and this mastery of disguising his true intention could also be said for his seal. Did he choose these symbols as a way of showing the world how he saw himself or how others saw him? Whether you believe these symbols have multiple meanings or not, it still provides an insight into how Burns wanted to be portrayed and remembered. He was a lover of nature and song, and even in his height of popularity amongst the literati of Edinburgh he never forgot his farming roots, which is evident in the shepherd’s pipe and crook in the centre. Nevertheless Robert Burns was a man not afraid to aspire beyond his supposed class, and this small seal and wax impression is evidence of this. This entry was posted in Exhibition, Object Focus, Robert Burns and tagged 18th century, Ayr, Ayrshire, Communication, Exhibition, history, learning, Letters, museum, National Trust for Scotland, nature, Object, Robert Burns, Robert Burns Birthplace Museum, Scots language, Writing.